In his career as a journalist William Finnegan specialised in conflict reporting. Surfing was something Finnegan had been ‘bewitched by’ since he was a child, and continued to pursue as an adult, but was an aspect of his life he didn't share with non-surfing friends and colleagues. His reticence on the subject perhaps stemmed from his own ambivalent feelings about the compulsion he felt to surf (‘I was always trying to break the spell’), perhaps also from an understanding of the unwritten surfer’s code that says you don’t comment on another surfer’s prowess: ‘A surf crowd is a delicate social unit. Everyone out there is starring in his own movie, and permission is required before you inflict your exploits on anyone else.’ It was an article Finnegan wrote for the New Yorker about his friend and big-wave surfer Doctor Mark Renneker that attracted a considerable amount of attention, leading to this autobiography, and firmly ‘coming out of the closet as a surfer’. ‘The only audience that matters to most surfers is other surfers, for they alone can truly appreciate what they are seeing’, Finnegan comments. But in Barbarian Days he manages to write about surfing in a way that non-surfers can appreciate, understand and even start to share some sense of his fascination and wonderment for the things he has experienced through his lifelong passion for the surfboard and the sea. Despite the fact that none of us have any experience of or particular interest in surfing we were absorbed by Finnegan's memoir. 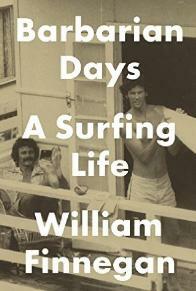 For some the surfing was as enthralling as the other elements in Finnegan's life (relationships, work, travel). For others the surfing was something to be skimmed over to get to the more interesting bits. There was a sense that Finnegan had deliberately kept the focus narrow. We would have liked to have had more context, more of a sense of the wider events that took place and that he lived through, or when travelling we wanted more insight into the places he visited (we enjoyed for example his detailed description of life as an outsider in a Hawaiian state school). But Finnegan always brings the narrative back to the waves and we appreciated this must have been a deliberate strategy in composing this book. We liked that he brings an intellectual's perspective to such a purely physical pursuit, and the lengths he goes to in order to describe his experiences, to convey some sense of his understanding of the waves, and the thrills and dangers encountered makes the reading thoroughly worthwhile. We liked the way this book was an inadvertent (or perhaps calculated) portrait of masculinity, composed by a self-aware narrator who is as alive to his own character flaws as he is to those in others. The people who feature in this book are always nuanced and full of complexity. We've never come across anyone like William Finnegan, and most of us couldn't imagine doing any of the things that he has done, but we had pleasure in reading about them. An excellent writer brings a world that for most of us is completely unknown brilliantly and vividly to life. Not just a sporting memoir, a thoughtful exploration of a particular path through life as Finnegan attempts to understand his own enchantment with surfing and the sea. Beautifully written memoir by a very engaging writer. He drew me in and painted the picture. But I confess I was bored by the surfing. What I want to do is read other things Finnegan has written – his book about his experiences teaching in South Africa for example. I think I would have enjoyed Barbarian Days more as an article than a book. I don't usually love non-fiction but this absolutely transported me. I found Finnegan likeable, flawed, self-aware, a narrator who brought the benefit of hindsight to his motivations and desires so as to truly understand them. I've never met anyone like him, I can't imagine doing even 1% of the things he does, but I liked it for that. Did I enjoy the surfing? Yes, I did. Amazingly written. There is a profound intimacy with the sea and the force of the elements and Finnegan took me out there. But I would have liked more of a cultural context: Hawaii, 1969, not going to Woodstock. He's a New Yorker writer, I think he could have written it all. I loved Finnegan's writing and the way he brought surfing so vividly to life for me. I particularly enjoyed the descriptions of his fellow surfers and his interest in the complex social codes and hierarchies that exist between groups of men. I loved the adventurousness of his travelling years and his lack of inhibition or self-doubt when it came to exploring the world. Mainly I liked the reflective quality of his writing and the sense of entering a world that I will never experience, but through Finnegan's words I was able to fully imagine. And the way that the book was so much more than straightforward description; Finnegan's writing has a poetic quality that I found quite beautiful. This book club took place on 31 October at Sally's where we enjoyed delicious roast chicken followed by blackberry and apple pie with a dollop of double-cream (I mention it because it was so good). We are a week away from the US election, will it be Clinton or Trump? The clocks have just turned back and by 5 p.m. we are plunged into black darkness, but on the plus side the leaves are beautiful and we've had some classic autumn mists.